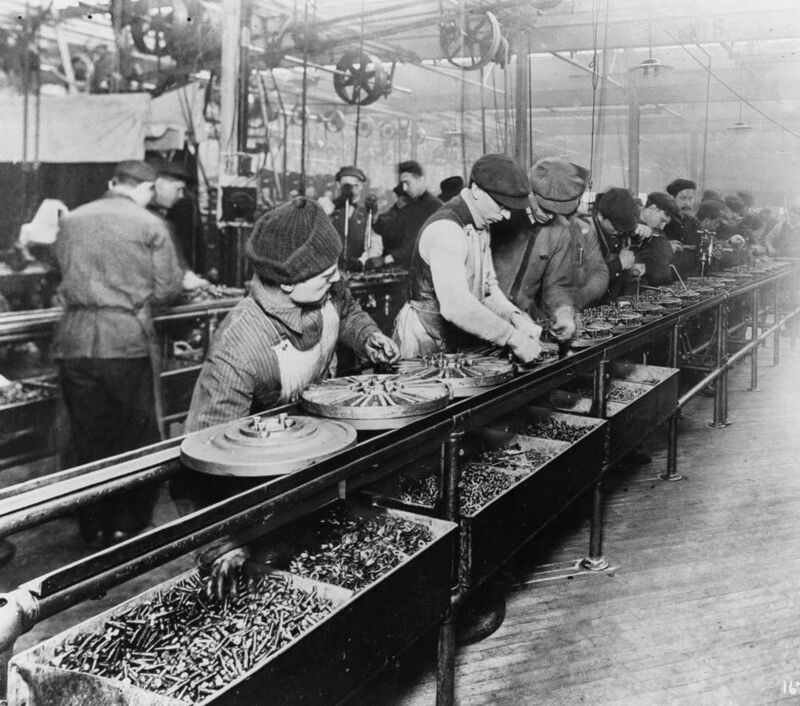 If you tell people you build productivity technology, they often think of assembly lines, conveyor belts, and stopwatches. Productivity means building things faster, right? Wrong. That view is so 20th century. Today, the real problem workers have is finding collaborative spaces to share information. Right now, our productivity tools often make even more work. Instead, we should build tools that emulate face-to-face interactions instead of assembly lines. Doing things faster was indeed a problem for early industrial times. Production was slow, inconsistent, and riddled with errors. Engineer F. W. Taylor’s “scientific management” emerged as a solution to this problem. Taylor, a probable obsessive compulsive, devoted his life to finding “one best way” to do everything. He also gave managers everywhere an excuse to control workers more tightly. But today, we already have high-quality production. Systems like six sigma and lean production have standardized and stripped down production processes to the leanest, and most consistent elements. Innovation isn’t about “being faster,” but helping workers collaborate and share. Why does collaboration matter more than ever? Today’s products are complex. 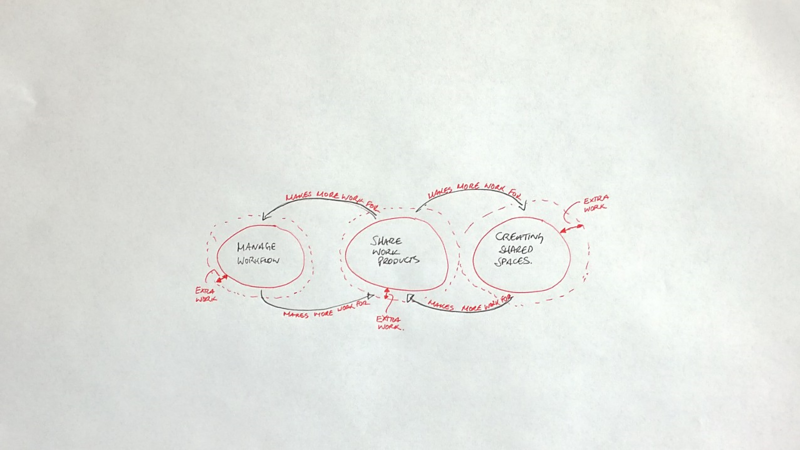 Rarely can only a single discipline design, build, and market a product. You need designers, engineers, and marketers to be truly successful. But this means they have to coordinate schedules, share information, and share their expertise. They need tools to store information, to build trust, to smooth cultural divides, and to protect heads-down time. Collaboration means working together, but also it ironically makes more work. Managing workflow: Who will do what, and when? This is especially difficult in heterogeneous, disparate, or physically distributed teams. Typical tasks include scheduling and task allocation. Creating shared information spaces: Creating, sharing, distributing, maintaining, and finding shared artifacts. Typical tasks include sharing via email or dropbox. Moving work products between collaborative spaces and individual spaces: Removing artifacts from shared spaces to complete an individual task, and replacing them into shared spaces. Typical tasks include checking in or out documents or code. These three large buckets can overlap. For example, allocating tasks in a co-located team may mean simply writing down assignments on a white board. But in teams distributed by time or space will need to create a shared, digital artifact that summarizes these task allocations. The irony is that as teams collaborate more, they create ever more shared digital artifacts, which increases the need for shared information spaces, and increases the cognitive load of evaluating whether a work product is ready to share. Our typical approaches for dealing with the collab penalty are no longer working. We have tried structured ontologies, or taxonomies. But it’s always so much faster to just talk with a person directly. That doesn’t scale. Informal ways are more powerful, and make less work. Instead we should use things like handwritten notes — in digital form — to give more fidelity to our messages. Human practices are far swifter and culturally adept than most technologies. This is the primary reason why work teams choose face-to-face strategies, even if they seem duplicative; informal strategies are higher in fidelity than structures or standardization.